Jacques Pépin makes quick pizzas with pita bread, lavash or flour tortillas. The possibilities are endless, from a simple Margherita to a white-clam pie inspired by the renowned Frank Pepe's Pizzeria Napolitana in New Haven, Connecticut. "The oven at Pepe's is heated with coal to over 2,000°," Pépin says. "While you can't duplicate that in your home oven, my tortilla version is quite good." The broth used in this tortilla-corn bread dressing, made with garlic-infused corn tortillas and tomatoes, also makes a delicious soup topped with pieces of chicken (or leftover turkey) and torn-up fried tortillas. Flour tortillas make a perfect cross-cultural substitute in this stellar take on the Chinese takeout classic. Use packaged coleslaw and presliced mushrooms to whip these up even faster. Piadina is a pan-grilled sandwich made with a quick baking-powder flatbread. If you’re in a rush, use a flour tortilla instead—try it in these gooey prosciutto-mozzarella piadine. Kathi rolls, a popular street food in India, are made by rolling vegetables or meat in roti, an Indian flat bread. 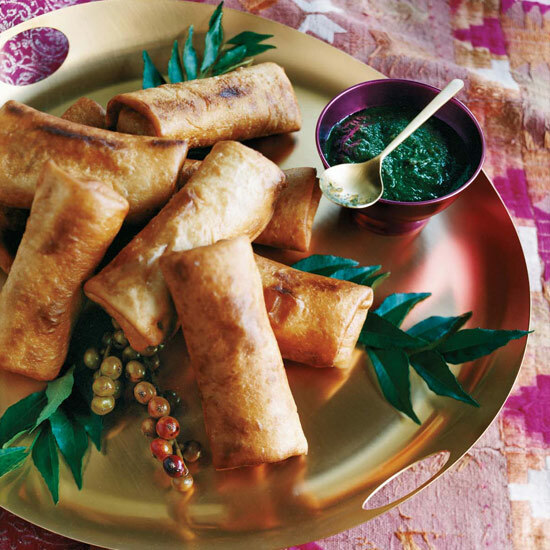 In her fabulous take on the recipe, Padma Lakshmi wraps flour tortillas around a succulent filling of ground turkey, fresh ginger, curry and basil, then pan-fries the rolls until crispy for decadent hors d'oeuvres that can be eaten as finger food. Flour tortillas are a perfect substitute when making homemade blintzes, like these blackberry-cream cheese beauties. Chef Dean Fearing's delicious twist on corn bread stuffing is a kind of chilaquiles, combining crispy fried tortilla strips with crumbled corn bread, jalapeño and cilantro.